Now that Fulltone founder Mike Fuller can get matched pairs of germanium transistors again, he was finally able to reintroduce his first pedal (the '69 fuzz pedal) as the '69 mkII fuzz pedal. The '69 mkII is everything you're looking for in a fuzz pedal - vintage vibe, flexible tone, solid construction, and a great feel. That's probably why the '69 is a favorite of Eric Johnson, Robin Trower, The Black Crowes, and many other notable artists. Four knobs give you all the control you need - input level lets you find the sweet spot, and fuzz dials in the right amount of funk. Use the contour control to perfect the midrange, harmonics, and sustain of the effect, then adjust the volume to hit your amp just right. And if you're a tweaker, there's an internal control to adjust the clipping symmetry, harmonics, and tracking, for a completely customized feel and tone! Don't settle for just any fuzz pedal. Get the Fulltone '69 mkII. Due to the nature of the Germanium transistors in the '69 mkII, it requires a special center-pin-positive power supply if you don't want to run on battery power. The optional Fulltone FPS-2 (sold separately) is the perfect power supply for the '69 mkII. If you use a multi-pedal power supply for your pedalboard, it may come with reverse-polarity cables for use with pedals like the '69 mkII. Call your Sweetwater Sales Engineer for more info. 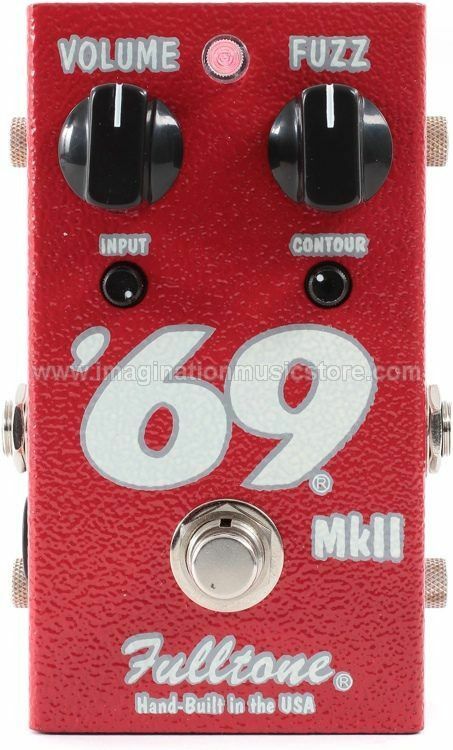 The Fulltone '69 mkII is a fuzz-blast from the past!